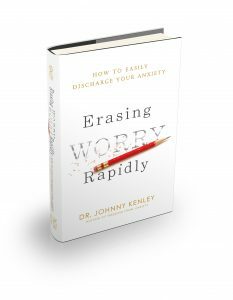 Just released in August of 2017, Erasing Worry Rapidly, gets to the point of what is blocking you from getting what you want. It is a wall. There is a wall of worry and anxiety blocking you from getting what you want in life. You are going to need to dismantle that wall. How? Drugs don’t work, and talk is seldom ever enough.Talking, thinking, and analyzing may ease or dial down your worry or anxiety. And this is good. But, they will never eradicate your worry, whether you try it yourself or enlist the help of others. Millions have come to learn this but only after investing hundreds of hours trying to do so with a best friend, with clergy, or with trained, dedicated, and well intention-ed therapists of many different flavors. It’s even more absurd and crazy to imagine you can eliminate your worry or anxiety with alcohol, drugs, or prescription meds. Billions, around the globe, try this without success every day. There is a new innovative way. This wall is generated and is maintained by your disturbed energy-field complex. You are going to quickly learn how to disable the disrupted negative-energy field that has been keeping you bound in worry—worry that may have been there for years! You are going to eliminate that wall by yourself. What are the 7 Myths and Lies about stress, worry and anxiety? What are the 6 Areas of your Life destroyed by worry and stress? What are the 5 Obstacles that stand in your way of eliminating stree and anxiety? What are 4 untold truths that you need to know?